Do you know a war was stopped to watch Pele play football? He worked for some time as shoe shiner. When he was in school, he bashed a classmate for calling him a nickname. Studies and football were never together for him. His mother got angry when he said he wanted to play football, but then he played football, and the history is full of his football even to an extend that he could stop a war to let people see him playing football. And he is Pele. Yeah the one of the greatest football players who even non-football lovers know about. His nickname (of course “Pele”) is one such name in the world that echoes louder than any other thing. Politicians and diplomats toil harder everyday to stop war. They work out and clean out every niche possible to clean the misunderstandings and wars. And many of them fail. But Pele? He did it. Yeah people, he did it. He did it even without telling them of working out negotiations. His mere passion in football ended up stopping a war for 48 hours, and that was something Godly. You agree with me right? What even if it was for 48 hours, but he did made people forget the contempt and cherish the football which could have been some people’s beautiful memory? 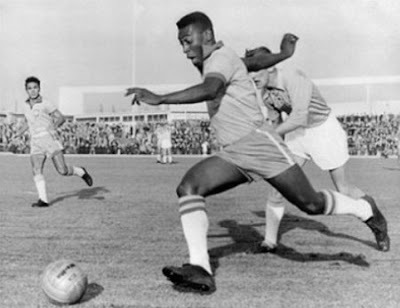 Right after retiring after winning a world cup, in 1970, Pele agreed to play an exhibition match at Lagos in Nigeria. There was civil war going on in Nigeria that time. However, both the groups agreed to halt the war for two days so that soldiers could enjoy catching the glimpse of football God Pele (Hope you guys now understand me calling him God). By the way, anyone know what’s his real name? Anyone? You never required knowing his real name just as Pele did. Everyone knows him through Pele. I am a die-hard fan of football. I have been following ever since world cup 2002, and I don’t miss reading about football or footballer’s in paper or magazine, yet I didn’t know his name until I goggled and found out that Pele’s real name is Edson Arante do Nascimento. But I feel just like every football lovers, Pele sounds too good. The beautiful game, as he put up once about football, is today one of the major attractions in the world. The global strength of football can exceed more than anything else. It’s one of the major and clean societies where in spite of any color you are, or any tribe you come from, if you play beautifully, you are right there to give beautiful world a beautiful game (well we don’t expect anyone to be charismatic and big enough like a normal height Pele to actually halt a war). He won three world cups. In 1958, as a seventeen year old teenager, he scored in final match. And in 1962 and 1970.